Logjam broken, I planned to divide The Ehrlich Family History into two volumes, the first concerning my grandparents and the other my father’s childhood. But by “dwelling on the matter” I did find myself at a dead end—wanting to turn the material into a novel, without much of a clue as to how. So the History’s finish date kept moving “father and father off” (as I Freudianly remarked in March 1975). As a writing project it remained officially active for another year or so. Doubtless trying to prime the pump, Grandma Ehrlich wrote her own five-page autobiography in 1976. I took three separate stabs at a fictional adaptation, As the Day is Long, with the Ehrlichs becoming the Edelmanns; but these stabs did no more than scratch the surface. And when my grandmother asked in 1979 that I send the diary translation to S.R., I did so after only the most token effort to make myself a copy first. In August 1983 I returned to the Ehrlich History material, "again being struck by the interesting story it would make." Setting to work on this in January 1984, I expected it to be soon over and done with. There was a palpable need for haste: Grandma Ehrlich, now aged eighty-eight, had entered a nursing home fully expecting to die; while terminal cancer was forcing my Aunt Martha into painful early retirement. So I slapped together “An Honest Tale Plainly Told” in February with more than the usual feeling of obligation to redeem a forsaken project. All the eyes in all the old photos seemed to stare at me askant, making observations on what a henyélő‡ I was. As things turned out, both my grandmother and aunt would hold on for several more years; and both expressed delight with “An Honest Tale.” To me, however, it was no better than a cobblejob—a patchwork pastiche of excerpts, extracts, and badly-xeroxed illustrations. It did manage to present the upbringings of József Ehrlich and Matild Kohn; their meeting in Budapest and marriage in Kolozsvár§ (where they produced daughter Márta); their coming to America and settling in Chicago (where they added son George); and how József, who wanted to be a teacher, ended up in the fur business. But my guiltridden jury-rigging haste hadn’t allowed me time to retrieve my aunt’s childhood diary, so I postponed recounting Martha and George’s adventures till a second volume could be compiled—by September, I thought. We hope we can give you the upbringing we both wish to. It is very hard my dear, lots of difficulty lies before us. You will think it was impossible when you are old enough to read this book. Hope you never will have to know the terrible things that are going on in this world today. The Ehrlichs, subjected to shakedown harassment, had just lost their millinery shop. 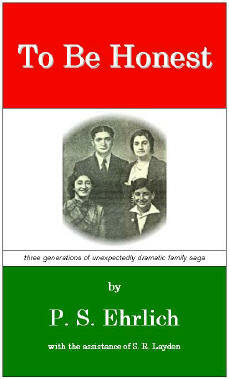 The family history had a succession of imposing backdrops—World War I, the collapse of the Austro-Hungarian Empire, the loss of Transylvania to Romania, the postwar surge of anti-Semitism, the cutback of American immigration; struggles adapting to the New World, weathering the Depression, dealing with the frightful loss of those left behind. And my grandparents coped with life in different ways. The ebullient Matyu “fell in love with America the very first day there,” fearlessly tackling an unfamiliar language and environment, quickly making good in her chosen field as an expert milliner. The more inhibited Józsi had a harder time of it: never comfortable with English, he dreaded being taken for an ignorant unlettered “bohunk,” and given the chance would have quickly decamped back to Europe. He found contentment in his home and household, raised his daughter to become the dedicated teacher he’d wanted to be, and above all remained true to his principles and beliefs. I uncovered such a wealth of untapped material that the project’s focus shifted. Discussing it with my cousin S.R., I conceived a Definitive Edition—To Be Honest—that would be “not dry” but written with a view to publishability. “An Honest Tale Plainly Told” would serve as both source and draft. Martha’s Diary, presented in its twice-translated entirety, comprised Volume II in August 1984; the rest of Martha and George’s adventures (through 1942) went into Volume III, completed in November. The Definitive Edition’s three-part/eighteen-chapter scheme was defined in April 1985 by a scissors-and-tape layout and reinforced by an index-card boildown. Paying a visit to the University of Illinois campus, I began extensive research into the European side of things, from the Hapsburg heyday to the Holocaust. By the end of spring I’d crammed thirty-four single-spaced pages with ancillary notes, causing my worn-out Smith-Coronamatic typewriter to literally shake itself to pieces. That summer I went so far as to accompany S.R. on her honeymoon odyssey to the Desert and back, digesting (to and fro) a superabundance of Ehrlichian archives** from 1943 to 1963. Volume IV waddled forth in August 1985, so heavyset that I had to jettison its Ancillary Appendix—and move To Be Honest’s overoptimistic deadline to March 1986, half a year further along. More than I knew. Between October 1986 and February 1987 I sent out Book Proposals to a couple of publishers and a couple of agencies, getting all four BPs back with commendable if regrettable swiftness. The last-arriving letter came from an genuine (so to speak) New York literary agent, who’d decided To Be Honest was not something she could “market with success or with enthusiasm at this time.” By which point I had come to the same conclusion: structured as it was, the book had proved unseaworthy. Despite a year’s worth of polishing and furbishing and waterproofing, it had ended up less-than-marketably “dry” after all. My basic instinct, as in the mid-Seventies, was to novelize the material—along similar lines, perhaps, as Diane Pearson’s Csardas. Although it descends at times into subgeneric romance, Csardas is soundly plotted and deftly written, maintaining historical authenticity through the changing fortunes of a half-Jewish Hungarian family from 1914 to 1948. But how to make To Be Honest that shipshape, if not unsinkable? “More ‘narrativized,’” I decided, “fewer quotation marks.” If I stuck to the diary format, it might compensate for the sketchiness of the opening chapters by keeping Józsi and Matyu’s childhoods at a reminiscent remove. Gaps could be filled with artistic license: “I suppose I should put down on paper what I remember of my own father,” József might write, describing how as a boy he could be disciplined by a stern look, but his capricious brother Sándor had to have his hand smacked with a ruler (and would then boast about it, claiming Father had sent all the way to Vienna for this ruler, keeping it under lock and key in a special drawer). Et cetera and so forth. But while the story’s beginning could be shored up, its ending posed other problems. Difficult to save it from being a downer: my grandfather suffered from Parkinson’s disease, and when ultrasonic surgery failed to ease its tremors, he must have felt let down by the rational world where Science held the promise to solve all problems. And in fact he pretty much turned his face to the wall and died. Another insoluble dilemma was posed by Grandpa Ehrlich’s having been in the fur business. No matter that in the days before central heating, a fur coat was a winter necessity; you can hardly envision a modern-day miniseries about an unvillainous furrier. Yet change him to a milliner, or a tailor or haberdasher, and you lose unique details of the Depression fur trade: each year’s first snowfall would net the children a whole nickle each, because snow heralded the beginning of “the season”—people would pick up their coats from storage (and pay their bills). No: better, perhaps, when all was said and done, to “mine” the Family History for material rather than expect it to stand up on its own. Neither in 1986 nor in 2009 did/do I claim that this is the most dramatic Family History ever written, or the most poignant, or the most (at times) absurd. Merely to its being “interesting enough even for a stranger,” as my Grandfather Ehrlich observed in 1931; and true to life. True, of course, since it came from being honest. * Which followed seventeen days later. ‡ Hungarian for "idler, sluggard, lazybones." § The capital of Transylvania: called Cluj by the Romanians, who took over the city shortly before Martha's birth. ** I spent eight straight hours that 4th of July in a Mojave Motel 6, sorting and glossing a Hefty Bagful of old photographs.